Dumb Bunnies beats Capt. Underpants. Ever get so excited about a book you just have to tell someone? Hayley did – and I’m so glad. 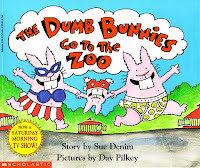 She e-mailed me about the Dumb Bunnies series, which she is enjoying with her whole family (ages 3, 7, 9, 39 and 39). If the illustrations look familiar, it’s because author Dav Pilkey also does Capt. Underpants (of which I am not a huge fan - but millions of kids are, of course). Every book Dav Pilkey writes has its own website, with printable crosswords, online activities and behind-the-scenes information about the books. Here’s the website for Dumb Bunnies. "Our son borrowed it from the school library last week and we were all laughing at it over dinner one night. The pictures and text are very funny. Our youngest pretended to read it again and again to himself. I guess I will have to break down and buy it." Oooh, that Capt. Underpants! Why, oh why, do kids have to love him so and why does he have to be so exhibitionist? Strangely enough, it's less his underpants and more that he's the principal of a school who is being humiliated that bothers me. And it's exactly that that intrigues the kids, of course. Sic 'im, bunnies, sic 'im! Grrrr. Happy First Birthday, Getting Kids Reading!